In a difficult programming situation it seems so easy to use a goto to take the control where you want. 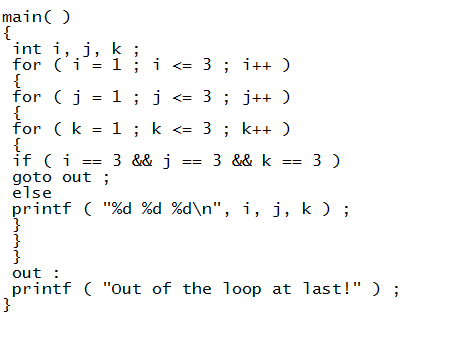 However, almost always, there is a more elegant way of writing the same program using if, for, while and switch. These constructs are far more logical and easy to understand. Avoid goto keyword! They make a C programmer’s life miserable. There is seldom a legitimate reason for using goto, and its use is one of the reasons that programs become unreliable, unreadable, and hard to debug. And yet many programmers find goto seductive. The big problem with gotos is that when we do use them we can never be sure how we got to a certain point in our code. They obscure the flow of control. So as far as possible skip them. You can always get the job done without them. Trust me, with good programming skills goto can always be avoided. This is the first and last time that we are going to use goto here. However, for sake of completeness , the following program shows how to use goto. A few remarks about the program would make the things clearer. − If the condition is satisfied the goto statement transfers control to the label ‘sos’, causing printf( ) following sos to be executed. − The label can be on a separate line or on the same line as the statement following it, as in, sos : printf ( “To err is human!” ) ; − Any number of gotos can take the control to the same label. − The exit( ) function is a standard library function which terminates the execution of the program. It is necessary to use this function since we don’t want the statement printf ( “To err is human!” ) to get executed after execution of the else block. − The only programming situation in favour of using goto is when we want to take the control out of the loop that is contained in several other loops. The following program illustrates this. Go through the program carefully and find out how it works. Also write down the same program without using goto.